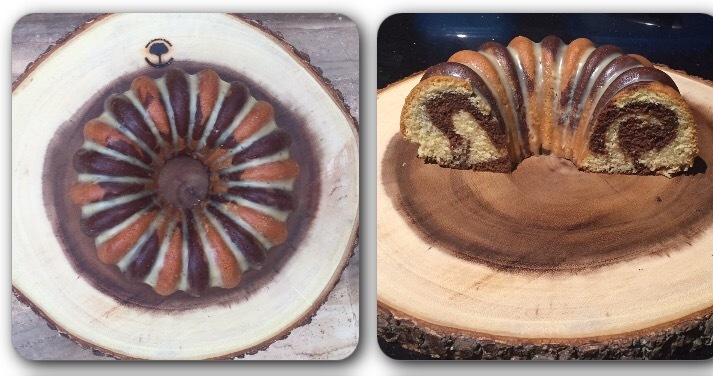 Chocolate Orange & Almond marbled Bundt with Salted Caramel. Anyone who follows me on Twitter or Facebook, will know I enjoy baking and especially when it comes to NordicWare and Bundts. This Bundt was made using a recipe from Ruby Tandoh (GBBO Finalist 2013) and has been cooked in the Elegant Party tin from Nordic Ware. Coat the Bundt tin liberally with Cake Release, making sure to coat all areas well. Everyone has different views on what to use for this. Myself, I use Wilton Cake Release bought from Lakeland. In a bowl, mix the flour, baking powder and ground Almonds together. Beat the eggs into the creamed mix one at a time, adding a spoonful of the flour mix between each egg. Once all mixed, fold in the remaining flour mix and stir in the milk. Combine the Cocoa powder and hot water to make a paste Divide the cake mixture equally, into 2 bowls. Into one half add the cocoa paste and mix well. Then into this mix, add the zest from the large orange. Bake in the centre of the oven for 40-50 minutes. Test to see if cake is cooked using a skewer, it’s cooked when the skewer comes out clean. Place the caster Sugar and golden syrup in a small, heavy bottomed pan along with 1 tbsp water. Place over a low heat, allowing the sugar to dissolve. Then bring to the boil and cook over a medium heat until the syrup turns an amber colour. Remove from the heat and add the double cream and butter to the hot pan. Return the pan to a low heat to allow the caramel to melt, then continue to cook until it thickens the back of a spoon. Remove from the heat and add the sea salt, stirring well. Pour into a container and leave this to cool while your Bundt is cooling. 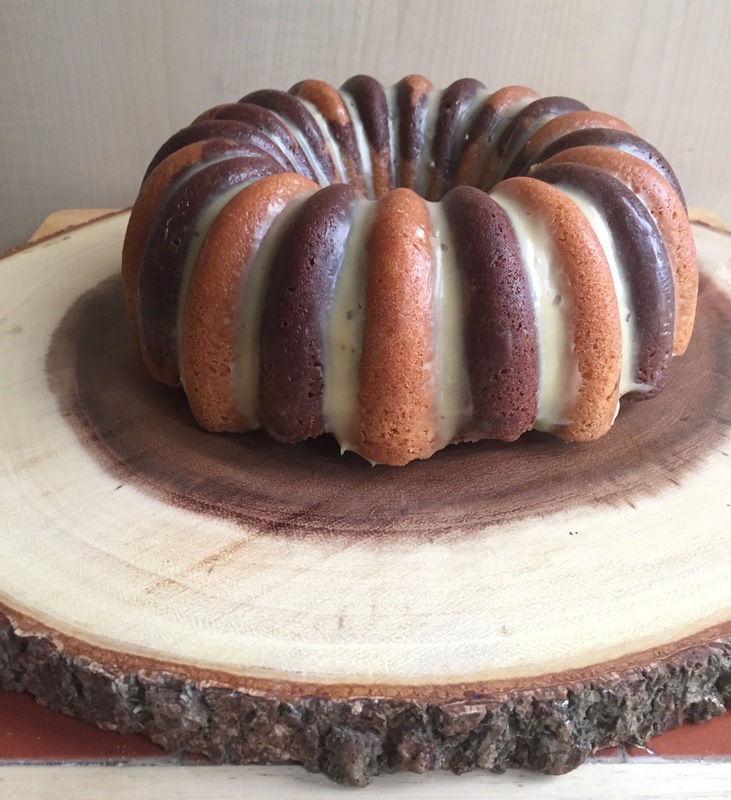 Once your Bundt is cool, stand it on a wire rack over a tray. Drizzle the salted caramel down the ridges of the tin (as in the picture) You may need to do this several times, to get a decent coating of caramel. Allow the caramel to set between each layer. I think it is safe to say you are the Bundt King. This Bundt is stunning (and I love the wooden board). The stripes are really impressive. Brilliant cake. Sammie. Thank You Sammie. I do enjoy making and decorating these #Bundts using NordicWare tins. There’s so many tins and so many ways to decorate them.